A week is all I have left in the Cosmic Hamlet by the Sea. Everything I do now is shadowed by the notion that it could be my last time. 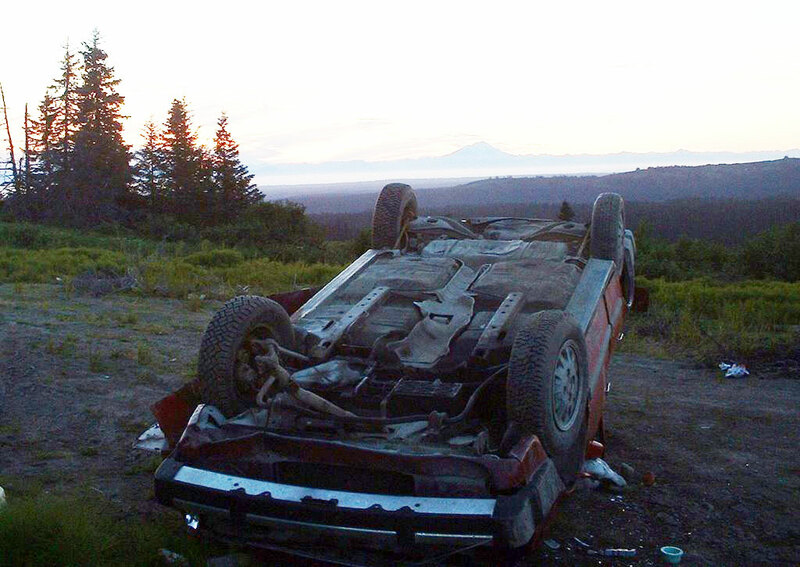 My last small town surprise - an overturned Subaru laid to final rest beside the silent shadow of Mt. Redoubt. I know it's not the last. I know it's not yet over. But I already miss it. Please take it from an old traveler that the best time to miss a place, culture, life; is just before you leave it. And if you celebrate it with a tear and a toast, it will keep a larger room in your heart. I stumbled across your blog and it's great. Good luck in Juneau, I'm hoping to get down there to ride sometime myself. Drat -- I'll miss Homer, too. Or seeing it through your tales. It's bittersweet melancholy leaving a place. I just moved 1400 miles from paradise to hell, so I sympathize. Did you know your blog was featured at BlogHer the other day? Poignant -- reminds me of our parting words to The Greatland. Good luck in Juneau.